The complex nutrition industry is growing ever more relevant to today’s consumer, and we expect the specialised nutrition market is set to experience strong growth in the coming years, especially in North America, where profits are high, and in the Asia-Pacific region, where the middle class is expanding. As technologies evolve and our knowledge of medical needs increases, this market will benefit from ongoing research and development (R&D). Food and drink companies are spotting the potential in specialised nutrition, so are starting to invest in the market – particularly in Foods for Special Medical Purposes (FSMPs). The world’s largest dairy exporter Fonterra, for example, has launched a Medical Nutrition and Healthy Aging division. It has been tasked with developing science-based nutritional solutions that help to treat people who are suffering malnutrition, cancer and other diseases, as well as help people age in good health and live longer. We believe that Specialised Nutrition is a space where brands could invest in if they want to focus on meeting consumers’ immediate specialised nutrition needs – from nursing mothers to senior consumers and from infants to athletes. Nestlé, for example, has recently opened a new R&D centre for maternal and infant nutrition in Ireland. 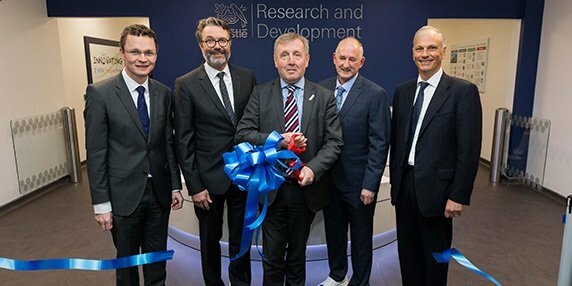 The R&D Centre was formally opened by Michael Creed, Minister for Agriculture, Food and the Marine, and Thomas Hauser, Head of Global Product and Technology Development for Nestlé S.A.
Increasing investments from manufacturers in R&D for enhanced nutrition products and focused at improving the health of consumers would help in further market expansion. Growing awareness about the relationship between health and nutrition would also help the specialised nutrition market to succeed in the long-term. We have invested, and will continue to invest, in this diverse market – from understanding the ‘lifestyle’ nutrition choices consumers make, to identifying opportunities to better meet the needs of those with complex nutritional requirements. 1. (FSMPs) – targets the general health of the elderly and formulated for the management of specific health conditions. 2. Infant & Maternal Nutrition – includes all baby formulas and foods for infant and young children’s development, as well as those for conceiving and prenatal mothers. 3. Performance Nutrition – promotes physical and mental performance for athletes. 4. Weight Management – targets nutrition formulas to help adults improve health through weight loss. And we’re not just investing in more products. We are expanding our food science team of experts, and following a consultation process with key players in the market, we are also adding more positioning claims and formats. This will make it easier for clients to find products with a certain function or target audience and to run more specific analyses of the trends within the market. A better approach to global nutrition, health and wellness is critical to the world’s future. We’re helping businesses prepare by providing actionable insights on a range of relevant topics – from ageing well to life stage nutrition, and from the keto diet to microbiota. Our experts have been combining market analysis, competitive intelligence and product intelligence to generate best in class insights and recommendations for over 40 years. Our investments in specialised nutrition means that we’re bringing this expertise to the forefront of a complex industry, and helping our clients make better decisions faster. Interested in finding out more? Then click here to learn more about Mintel GNPD, while clients please contact your local Account Manager.